Most neighborhoods in Paris have a cafe at the corner of the main street. It’s where the locals hang out for a morning coffee and a chat while standing by the bar, or where people linger at terrace tables smoking cigarettes, having a drink and people-watching. Cafe culture is one of the things I miss most about not living in Paris and something I try and do as much as I can when I’m there. Our neighborhood cafe during our stay was Le Nemrod, conveniently located on a sunny corner of the rue St. Placide and cherche-midi which was a block’s walk from our hotel. We had our morning café crème and croissant there before setting out for the day and then stopped by again either for lunch or a cold drink before heading back to the hotel. By the third day, we were regulars and would even manage some small talk with the morning crew. 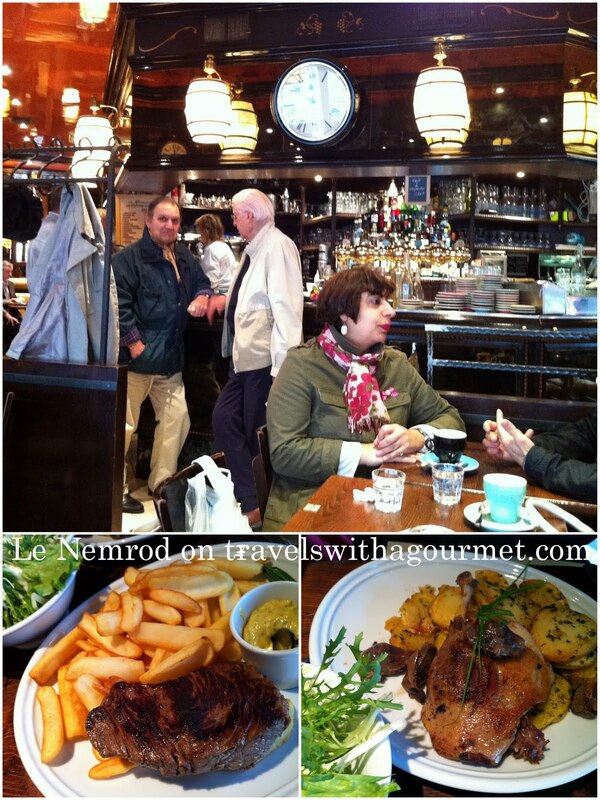 On one of those days, we had a late lunch at Le Nemrod – a standard rumpsteak frites and a green salad for me and the confit de canard for my mom. My steak was cooked well – rare like I asked for and came with lots of hot, crispy fries and a side of Bearnaise. The small green salad was dressed in a mustardy vinaigrette and was the perfect accompaniment to my steak. My mom’s confit de canard was a large duck leg served with delicious, garlicky pommes sarladaises (thinly sliced potatoes cooked to a crisp in duck fat then sprinkled with garlic and parsley). I ate most of my steak with my mom’s garlicky potatoes and the green salad but couldn’t manage to finish my own mound of frites. Le Nemrod is neither fancy nor cheap but it’s a typical cafe packed with locals from the area and a few tourists who are in the area. The atmosphere is friendly and the food quite good plus there’s lots of people-watching to be had on the lively terrace on a sunny, spring day. *Open all-day everyday for breakfast, lunch, dinner and drinks.